*ETA: The buns you see in these pictures are the Gluten Free Hawaiian Buns from page 181 of Gluten-Free on a Shoestring Bakes Bread, and it’s reprinted here on the blog! 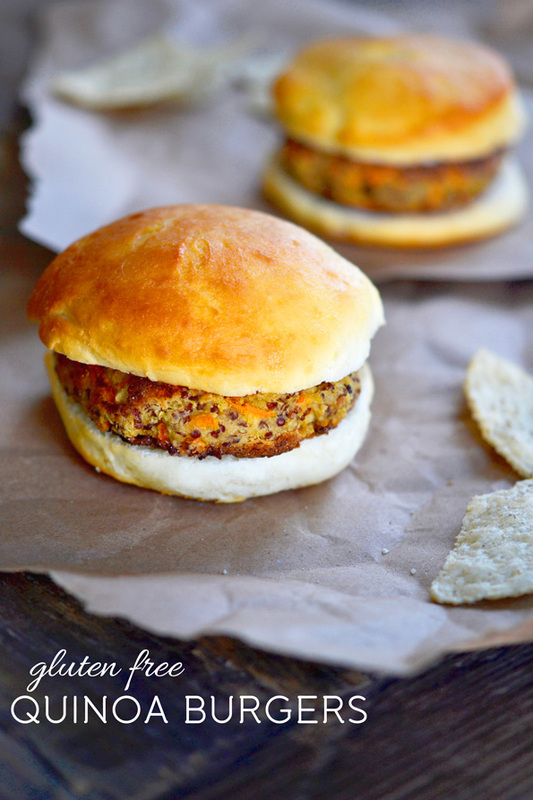 These gluten free quinoa burgers are really healthy vegetarian gluten free hummus quinoa burgers. But I thought perhaps that might sound, well, unfamiliar. You basically throw together simple hummus (one of only two ways my very wrong children will eat garbanzo beans) and add cooked quinoa, eggs, shredded carrots and a few other assorted delectable ingredients. They’re vegetarian, they’re healthy, plus crisp on the outside, creamy on the inside. They’re your basic dreamboat dinner. The gluten free hamburger buns you see are the soft hamburger buns from Gluten-Free on a Shoestring Bakes Bread out this November. **ETA: the book is out and you can have that bun recipe right now! I used my food processor, even though I’ve had it for so long that I actually think the steel blade is losing its edge. It’s just not as evil as it used to be. That, and I despise cleaning it. More accurately, I mostly dislike drying the food processor. I never feel confident that I’ve done the job well. I used my homemade fresh gluten free bread crumbs, but you can use some crushed gluten free cereal if need be. No finely ground bread crumbs, though, por favor. We need some bulk here. I used red quinoa because I’m partial to its pretty blush, but all quinoa tastes alike. You’ve got tremendous freedom of choice here. 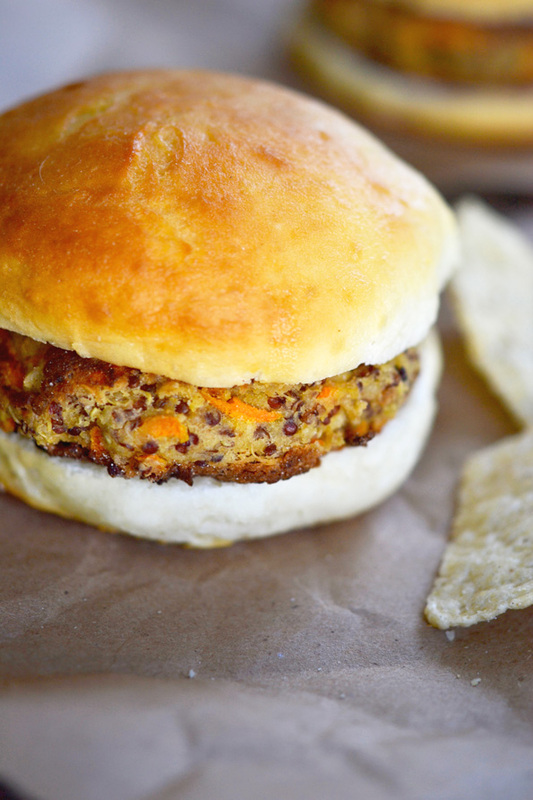 I shallow fry these quinoa burgers in some ghee, and then bake them in the oven for a spell. That way, they crisp in the pan but do not blacken as I attempt to cook them all the way through, end to end and top to bottom. Again with the hamburger buns. I know. But you know I will make it all up to you when my celebration of gluten free bread hits this November. And anyway I should be able to show you the new book cover very, very soon. You’ll be so happy, you’ll forget all about how mad you are at me. Promise. Preheat your oven to 300°F. Line a rimmed baking sheet with unbleached parchment paper and set it aside. 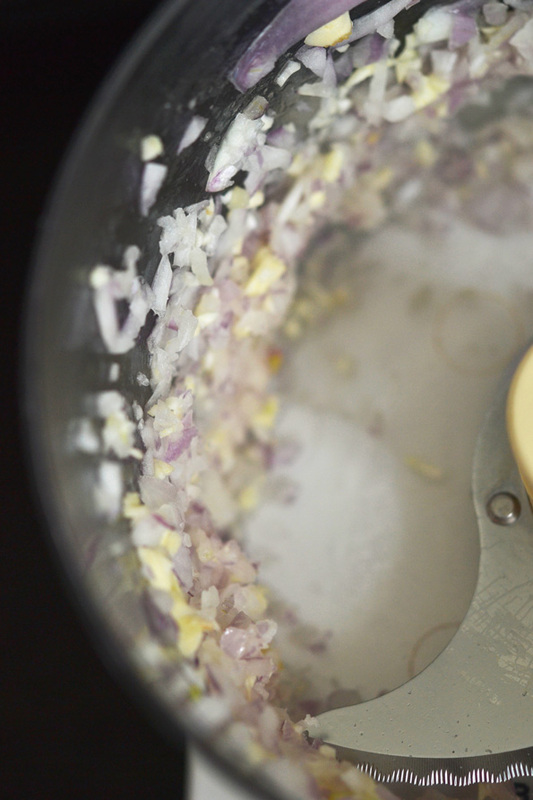 In the bowl of a food processor fitted with the steel blade*, place the chopped shallot and garlic and pulse until finely minced. Add the garbanzo beans, the salt and the lemon juice, and pulse until mostly smooth. Add the eggs and pulse to combine. The mixture will have become relatively thin. 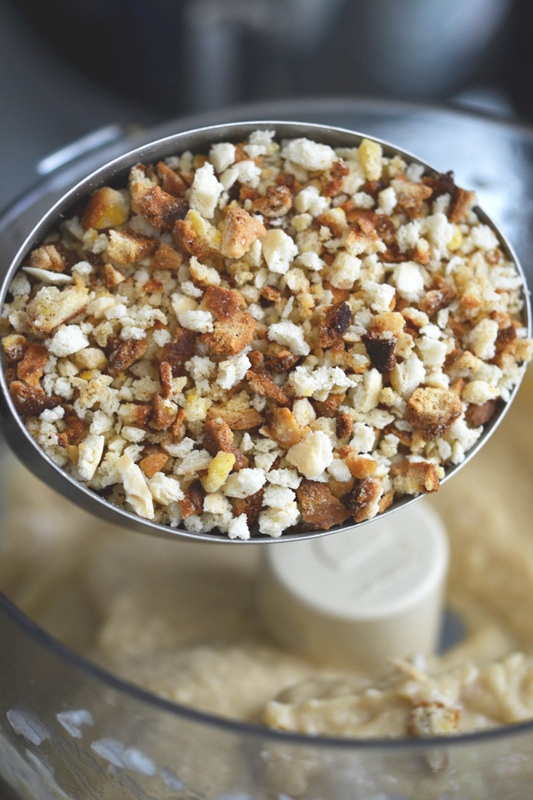 Add the bread crumbs and rolled oats, and pulse until the mixture begins to come together. 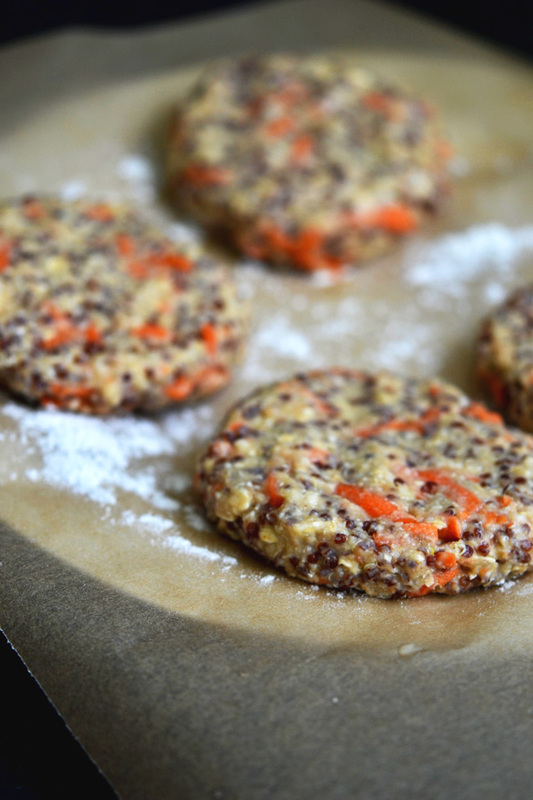 Transfer the mixture to a large bowl, add the quinoa and shredded carrots, and mix to combine well. Cover the bowl and place in the refrigerator until the mixture thickens and becomes firmer (about 15 minutes or up to overnight). Remove the bowl from the refrigerator, uncover it, and, divide the mixture into 10 separate burger patties. Moisten hands with cool water as often as necessary to prevent the mixture from sticking to your hands. Place each shaped patty on a paper towel and blot it dry. Heat 2 tablespoons of ghee in a large, heavy-bottom saute pan over medium heat until the ghee is melted and begins to shimmer. Place as many patties in the pan as will fit without touching one another and fry until golden brown on the underside (about 3 minutes). Flip the patties and fry until golden brown on the other side (another 2 to 3 minutes). Remove the patties to the prepared baking sheet. Repeat with the remaining patties, using the remaining ghee as necessary. Place the baking sheet with the burgers on it in the preheated oven and bake for about 10 minutes, or until mostly firm to the touch. Serve warm. 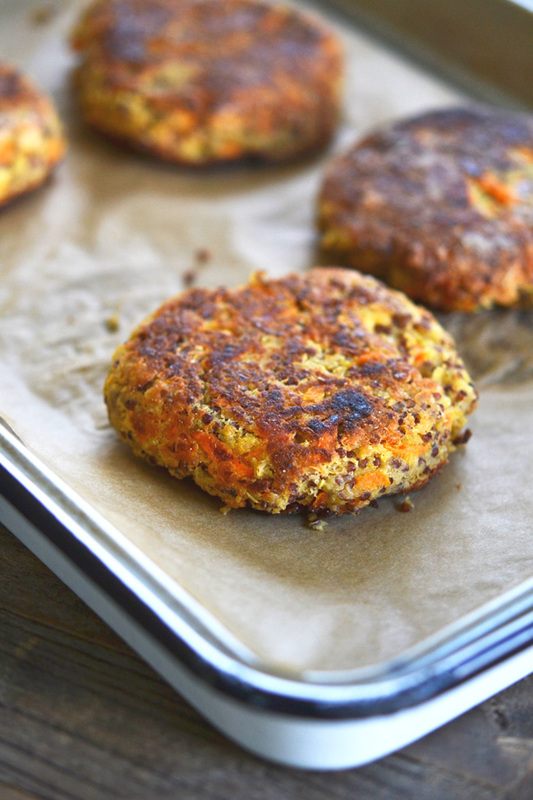 *Note: If you either do not have or do not want to use a food processor, you can make these quinoa burgers entirely by hand. Simply mince the shallot, garlic and the garbanzo beans by hand as finely as possible, and press them into a paste with the flat of a chef’s knife. Proceed with the rest of the recipe by mixing the remaining ingredients together by hand. P.S. If you haven’t yet, get your copy of Gluten-Free on a Shoestring Bakes Bread! Your support makes the blog possible! A thought on drying the food processor and other hard-to-dry items – I place them on top of the stove while it is baking. Set the food processor and blade on their side and roll them over partway through if the water pools. The heat from the stove dries quite quickly. Just Pre-ordered the new cookbook! Can’t wait to get it! Your buns look divine (sorry couldn’t resist:)… Looking forward to the new cookbook. Mom and I just started eating black bean burgers. It took me six months to get her to agree to eating them. I think I’ll wait a while before I slide one of these past her. As for the buns, I’ve been using the Japanese Milk Bread, (you know it’s my favorite), forming the dough into buns. They bake up well and taste so good. I was going to start throwing tomatoes, but I won’t. Because… as another option, maybe these would be tasty in a pita??? And I know you have a recipe on the blog for those! Sometimes my family (ahem, my husband) does not dig large quantities of bun with his sandwich innards. And if I start making GF buns FROM SCRATCH and he’s leaving pieces behind, I will get cranky. Sorry, family. Oh, I hear you, Donia! That’s why I never thought to give my children the option of crustless bread. That’s homemade bread! P.S. Meant to write this in my original comment. For those items that you worry about being fully dry (I’m looking at you, food processor), put them on your furnace/AC vent for a while. We actually run the fan 24/7. Living in a snowy place, I’m sure you sometimes put boots or gloves there, right? If you don’t want to put a cooking device directly on the floor, just put a tea towel down first. The air will still get through. My USA bread pan has a crimped/rolled edge, and I always feel it will retain water in it and rust. (Well, I only wipe it with a damp cloth now.) But I use that trick for a lot of things. Ok – I read the post and I’m MAD that you are not releasing that dang book until November… hahaha – not really but you were so funny about it! :) I actually was happy that it will be November and not December – yahoo! those hamburger buns look so wonderful it will be worth the wait. I can’t wait to see the cover and I hope this one has more pictures for those type A people that need to know they are doing it right and it looks right along the way (you can see I have issues!). Thanks for this wonderful recipe – I’m going to try this on our meatless day of the week! Yup – the publication date of Bakes Bread was moved up a bit (yay!). This book will be loaded with full color photographs throughout (I fought long and hard for that), including lots of process photos showing what the dough looks like, how to shape different kinds of bread, etc. I’m impressed you can get kids to eat hummus. Mine is such a pill. Will try though… great idea! For some reason, Kasha, although they love most other beans, they will not tolerate garbanzos unless they are in hummus or in falafel. Who knows?! Crissy, if you read through the post you’ll see that the recipe for the buns will be in my next cookbook, but I also mention a recipe that you can use now in my second cookbook. Do these freeze well? I notice there are no herbs – how is the flavor? Donna, I haven’t frozen them but I assume they would freeze well after being formed into patties. You’ll have to judge the flavor for yourself- clearly I think they taste great due to all of the other ingredients! As I say in the post, Kathy, they will be in my new cookbook, Gluten Free on a Shoestring Bakes Bread (November 2013). But I suggest another recipe in my second cookbook for buns as well that you can get started on right away.